1. What’s Bonjour doing in Safari? Is Apple just doing a clumsy “hard-sell” trying to push its latest “cool” technology? No, there’s a good reason for the Bonjour menu in Safari. Many of today’s network devices, like printers, network cameras, and home gateways, are configured and managed using a web browser. This is a great idea, except for one big problem: to access the device’s web page, you need to know what IP address to type into your web browser. Even if you know what address to type, typing IPv4 addresses by hand is barely tolerable, and being expected to type IPv6 addresses by hand is completely unreasonable. Bonjour solves this problem. 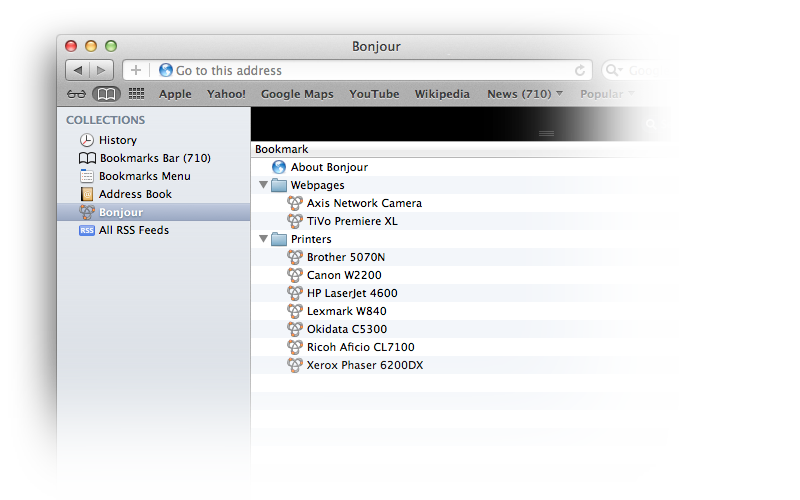 Safari displays a list of Bonjour-advertised web pages it finds on the local network. To view a device’s page you simply double-click on its name. 2. So why’s my Bonjour list empty? If the only thing you see in your Bonjour list is the “About Bonjour” link, then possibly you don’t have any devices on your local network that are accessible using a web browser. Or possibly you do have some, but they don’t yet advertise that fact using Bonjour. Virtually all network printers made today support Bonjour, as do devices like Axis network cameras. Other devices are starting to support Bonjour discovery too. If you have a network device that you can access by typing its IP address, but it doesn’t show up in Safari’s Bonjour list, contact the vendor to ask about Bonjour support. 3. I’m a developer. My customers are asking me about Bonjour. How do I get my device to appear in Safari’s Bonjour list? You need to add Bonjour support to your device. Information on how to do this can be found on Apple’s developer pages, and in the O’Reilly book Zero Configuration Networking: The Definitive Guide. Apple’s implementation of Bonjour for Mac OS X and iOS also runs on a wide variety of other platforms including Windows and Linux; it is Apache 2 Open Source and can be downloaded and used at no charge. Other Open Source implementations also exist, such as Avahi and JmDNS. If you're using an embedded development kit for your product, ask your development kit vendor about Bonjour support. For example, Microchip Wi-Fi kits include Bonjour capability. Android has native Bonjour support starting in API Level 16 (Android 4.1 “Jelly Bean”, released June 2012). 4. Is this just for hardware devices? Can other pages appear in Safari’s Bonjour list too? An airport Wi-Fi network could show an entry for a page giving flight departure times. A café Wi-Fi network could show an entry for a page showing the menu. A hotel network could show an entry for a page giving information about the hotel’s services. To have additional web pages show up in Safari’s Bonjour list, network administrators just need to add a few records to their existing DNS server. 5. Is this just for Safari? 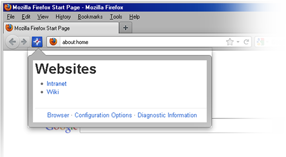 What about other web browsers? Bonjour service discovery is not just for Apple products. Safari is available for both Mac and Windows. For Microsoft Internet Explorer, a Bonjour plugin is installed with the Bonjour SDK for Windows. Firefox and Chrome use the DNSSD plugin. Bonjour (i) in Microsoft Internet Explorer on Windows, (ii) in Firefox on Linux, and (iii) in Chrome.